People might feel like they can get away with violating a traffic law or cheating on their taxes, but God and His laws work much differently. God sees everything we do, hears everything we say, and He really does care about how we behave. While the Lord offers forgiveness for our sins, there still are deadly consequences for breaking God’s law. 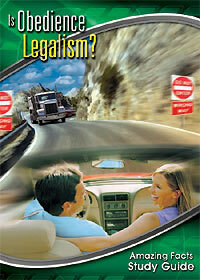 Amazingly, some Christians say any attempt to obey God’s law amounts to legalism. Yet Jesus said if you really love God, you’ll do what He asks. So is obedience legalism? Take time to read this Study Guide carefully… eternal consequences are at stake!